Designed in 1877, “Woodpecker” is somewhat unique in that it was designed by William Morris himself, rather than being a joint collaboration of artists. 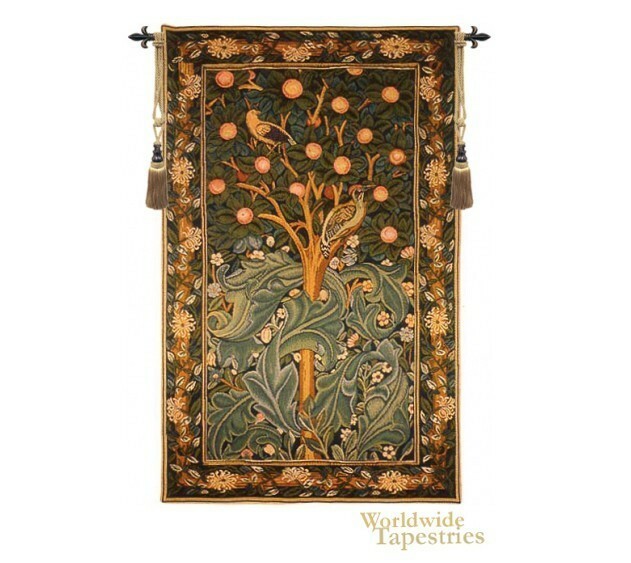 The original design for this tapestry is based on a poem of Picus, the ancient king of Italy who was turned into a woodpecker by the sorceress Circe because of her jealousy of the king’s love for his wife. “Woodpecker” is stunning in its design, composition and use of color. The woodpecker sits in a fruit laden tree, surrounded by leaves that are reminiscent of the “Mille Fleur” style made popular in medieval times. The original “Woodpecker” hangs in the William Morris Gallery in London. This reproduction is highly prized by collectors, given the personal attention Morris had in the work. It is lined and has a tunnel for easy hanging. Note: tapestry rod and tassels, where pictured, are purchased separately. Dimensions: W 30" x H 48"